OKLAHOMA CITY -- The game was two-and-a-half years ago, a simple regular-season tilt between the Oklahoma City Thunder and Golden State Warriors that ended with a moment of magic from Russell Westbrook. An offensive rebound and a save flushed the ball back to Westbrook in the deep left corner, and he splashed a 3-pointer at the buzzer to win. That 3 earned the highlights and the headlines, but around the Thunder practice facility, it was Westbrook's third quarter in that game that has become something of legend. Nothing was going right for him or the team, but Westbrook slogged downhill, relentlessly attacking, uncompromisingly trying. It was the quintessential Westbrook quarter, his competitive spirit and will trumping everything else happening on the court. It was enough to keep the Thunder in the game, and enough to eventually land the sweet payoff from that deep left corner. 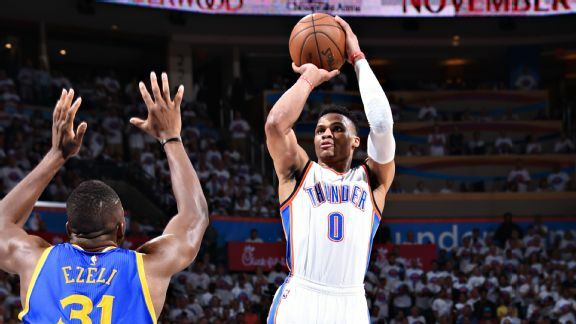 In Game 4 on Tuesday, Westbrook found himself back in that same corner. The circumstances this time were much different. The Thunder were ahead by 20 with three-and-a-half minutes left, but with the shot clock winding down, Westbrook launched again. All net, a punctuation on an emphatic 118-94 win as the Thunder took a 3-1 series lead. Westbrook turned and celebrated with his brother Ray, who was sitting right behind him. But it was the third quarter again in which Westbrook found that moment of magic. The Thunder had dropped another 72 points on the Warriors by halftime and held a 19-point lead at the break. Klay Thompson came out of the break determined to shoot the Warriors back into it and scored 19 in a matter of minutes. The Warriors were closing the gap -- to 11, to 8, to 6 -- but there was Westbrook, standing in the way of an oncoming storm. "I thought my energy was good," Westbrook said in what's the biggest understatement of the postseason. His final line: 36 points, 11 rebounds and 11 assists for his fifth career postseason triple-double. "I just try to read the game," he said. "They made a few shots, and I know my energy and my aggression can kind of impact the game, and that's what I try to do, especially in that quarter where shots weren't falling for us. Try to attack the basket and use my size and ability to get to the basket and create some havoc." Havoc is an apropos word for Westbrook. It's not exactly basketball beauty. Westbrook's downhill chugging runs in direct opposition of Stephen Curry's ballet of moves and jukes. But Westbrook's force of will is unmatched and unrelenting. The Thunder were tightening as Game 4 started to slip. Westbrook decided he wasn't going to let that happen. "To absorb the amount of minutes he's absorbed and to put his body on the line like he does ..." coach Billy Donovan said. "Listen, I played the game, but not at that level. I know how physically demanding and taxing that is to do what he does under those minutes. "As a coach, you sit there and you have great respect and admiration for somebody that plays that hard and gives to the game and his teammates what he gives." Russell Westbrook messed around for a triple-double (36 points, 11 rebounds, 11 assists) as the Oklahoma City Thunder crushed the Golden State Warriors 118-94 in Game 4 to take a 3-1 series lead in the West finals. It has always been a process of discovery for Westbrook, one he still admits he's in. He walks a fine line game by game, trying to read it, as he says, trying to pick the right spot. He tries to set the tone early in games, the way he did Tuesday, firing out six assists in the opening quarter. He tries to be a playmaker first and scorer second, to let the former dictate the latter. That line has long been the point of contention for Westbrook, as outside observers see that as ball-hoggery of the highest order, as him turning to a black hole that ignores teammates. What it has always been is an all-consuming competitive spirit that just can't let go. Westbrook can not, and will not, ever stand idly by and let a game get away without him at least having a say. "I'm a guy that doesn't do one thing," Westbrook said last week. "I do everything. I come out and do everything and whatever it is that needs to be done that particular night. "If it's scoring, then I'll score. If it's defending, then that's what I'll do. If it's rebounding, that's what I'll do. If it's passing, that's what I'll do. Whatever it is that needs to be done, that's what I'll do to make sure we win." In this case, Westbrook is also guarding the back-to-back MVP and leader of a historically great team. If there was ever a reason for extra motivation, it would be this. But it doesn't work that way for him. "I play every game like it's my last, regardless of who's in front of me," Westbrook said. "That's my job." For a lot of players, that's a platitude. Most can say it, but Westbrook lives it. He's ready for these moments because he played the exact same way in a third quarter in November 2013. He knows no other way. "Russell just plays with incredible passion," Donovan said. "He's got such great force and great will." The Thunder now sit one game away from a return to the NBA Finals. As Curry repeated three different times, the series isn't over. The 73-win Warriors will not go quietly. The next game is back in the Bay, and the Thunder will have to summon another skillful performance to get it done. They have the apparent momentum, if it actually exists, but they also seem to have the Warriors pegged. "Not no pressure, man," Westbrook said of closing the series. "It's the first team to four, and we've just got to find a way to get a win." That's the Westbrook way. Whatever it takes.